You are here: Home » The ultimate MacGuffin? A post from earlier this week, talked about god and suitcases. Now I have to talk about one of the greatest, and least well know, MacGuffin of all time. R2D2. What? I hear you say! I agree with you, in part. Until I was writing about MacGuffins and deus et machina I didn’t realise how much R2 was the ultimate. He was the item that everybody wanted and drove, in a way, the plot forward. He is in the background most of the time, but always important. 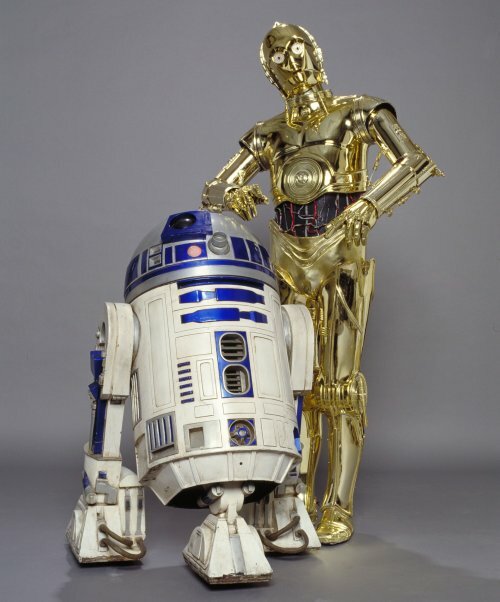 Always at his side is his companion, C-3PO. I’m not going to go on about what MacGuffins or deus et machina are as you can read about that in the original post. We can only use episodes 4, 5 & 6 to think about R2 and his use in the films, as episodes 1 to 3 were written after the fact. From the first time we meet the little astromech droid on the Tantive IV, with Princess Leia giving him the plans of the death star and message to be delivered to an “old Ben Kenobi” on an unremarkable planet. Tatooine. This is a classic, almost Hitchcock in use, MacGuffin. Something that drives the plot forward but not always in the picture. He is, unlike some MacGuffins, not forgotten when he has completed his task of driving the plot onwards. After we see the classic use of the MacGuffin, getting the plans to the required person to move the story onwards. As with most MacGuffins and act two of films, he isn’t called upon to drive things onwards. He does come back with a vengeance in the third act. With the help of Luke he destroys the death star because of what he did at the start of the film’s act one. Onwards to episode 5, and his meeting with Jabba the Hutt. Driving the plot onwards with C-3PO by his side. I’ll leave it there. Now you know what to look out for, you can fill in the gaps and make you ponder more about this little astromech droid’s importance in, ultimately , saving the day.